Chicago, Illinois - Greg Zanis carries a notebook in which he records the name of every Chicago homicide victim. Since 2016, Zanis, a retired carpenter, has made wooden crosses to remember each homicide victim. Chicago recorded 781 murders in 2016 and 664 in 2017. 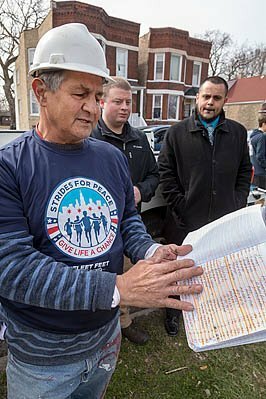 Image Description: Chicago, Illinois - Greg Zanis carries a notebook in which he records the name of every Chicago homicide victim. Since 2016, Zanis, a retired carpenter, has made wooden crosses to remember each homicide victim. Chicago recorded 781 murders in 2016 and 664 in 2017.